Shawna raced to Briana, asking where she saw a gun—it was in a bedroom where a visiting relative was staying. There, Shawna found her four-year-old son holding a gun as her two younger children looked on. When Paul and Kathryn Walters of Gladstone, Mich., moved into a new house with their three children, they didn’t know the previous owner had left a .22 bolt action rifle and a few rounds of ammunition in a closet corner where neither parent could fit. A Life-Saving Lesson The Dennet and Walters families—and countless others—credit the NRA’s Eddie Eagle GunSafe Program for teaching their kids how to prevent a potentially fatal accident. This groundbreaking gun accident prevention program for children in pre-K through third grade has reached more than 18 million children in all 50 states, as well as Canada, Puerto Rico and beyond. 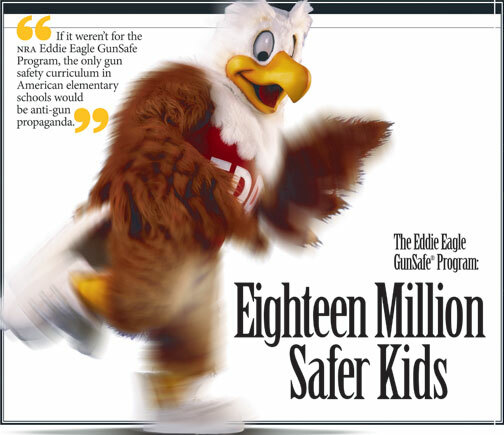 The Eddie Eagle GunSafe Program was the brainchild of NRA past-President Marion P. Hammer in response to anti-gun propaganda disguised as “safety” curriculum flooding our nation’s elementary schools. Over the years, the program has been praised by numerous groups and elected officials, including the Community Service and Youth Activities Divisions of the National Safety Council, the U.S. Department of Justice, the National Sheriffs’ Association and 26 state governors, to name just a few. Among children in the Eddie Eagle age group, fatal firearm accidents have been reduced more than two-thirds since the inception of the program, according to the National Center for Health Statistics. What’s more, a 2001 study published in the Journal of Emergency Nursing Online named Eddie Eagle the most effective among the more than 80 programs evaluated, drawing a distinct correlation between the Eddie Eagle Program and children’s lives saved. Statistics aside, it’s the volume of testimonials that the NRA receives each year from parents that proves the true value of the Eddie Eagle Program. Another recent example is the case of Billy Thornton, a third-grade student from Knoxville, Tenn. Billy found a security guard’s loaded firearm in a credit union bathroom. He had recently learned the Eddie Eagle message, so he alerted his father to the presence of the unsupervised firearm. For this, Thornton received an award from his community. An Award-Winning Program Eddie Eagle has been honored and endorsed by various groups such as the U.S. Department of Justice, the Community Service and Youth Activities Divisions of the National Safety Council, the American Legion, the Police Athletic League, the National School Public Relations Foundation, the National Association of School Safety and Law Enforcement Officers, as well as the National Sheriffs’ Association (NSA). The Eddie Eagle GunSafe Program has also garnered praise from 49 state legislatures and/or governors, who have urged their respective state school systems to implement the life-saving message the program offers. And the Community Service Division of the National Safety Council recognized the tremendous contribution that the Eddie Eagle Program has made in keeping kids safe by awarding program creator Marion P. Hammer with one of its highest honors, the Community Safety Award Citation for Outstanding Community Service. Since 1996, the program’s delivery has been enhanced by the availability of Eddie Eagle mascot costumes to law enforcement agencies that teach the program, helping capture child-ren’s attention during presentations. Threatened by Critics and Cashflow Keeping the Eddie Eagle GunSafe Program alive costs about $500,000 per year, on top of the millions NRA has invested in it from its inception through 2005. While funds raised through Friends of NRA and donations to The NRA Foundation help sustain the program, continued support is critical. NRA membership is not required to teach the Eddie Eagle GunSafe Program, and the lessons can be adapted from one- to five-day formats. Materials include workbooks, an animated video, instructor guides, brochures and student-reward stickers, all of which are available in Spanish, too. Anti-gun groups continue to be harsh critics of the program, apparently because it’s preferred over their anti-gun “safety” curricula. But the Eddie Eagle GunSafe Program makes no judgment call as to whether guns are good or bad. And Eddie himself never touches a firearm. Dr. Arthur Kellerman criticized it on fox News. But Jagels and School Superintendent Larry Reider countered the criticism and put the safety of children over political gain. Today, all the district’s principals have received Eddie Eagle program materials for use in their schools. (See “California’s Endangered Species,” America’s 1st Freedom, March 2006, p. 38). The NRA holds that all children—especially those who don’t grow up around firearms—need to know what to do if they come upon an unsupervised gun. By drawing this distinction between guns on tv or in movies, and guns in real life, Eddie Eagle teaches children they should never touch a firearm without adult supervision. As the program’s creator Marion Hammer said, “The NRA is committed to helping keep America’s children safe. This program also instills in our youth the important values of leadership, discipline and personal responsibility that will help our children throughout their lives.”That’s not indoctrination. That’s an NRA commitment that can benefit every child.